This series of articles is designed to help you solve some of those niggling household problems. These tips aren't intended to make you an expert, and are not a replacement for seeking professional advice where needed. Please feel free to contact us if you have any questions or comments. Even with a pump on your boiler, hot water naturally gravitates upwards. This means that your upstairs radiators can get very hot, while those downstairs stay quite cool because the water is rushed back to the boiler to re-circulate. The solution to this problem is very simple. 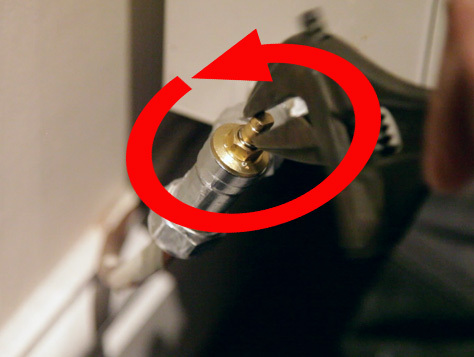 Pull off the protective cap from the lockshield (not the TRV*) and then using a small spanner, close the lockshield off by turning it anti-clockwise on all upsatairs radiators, then open it up again (turning clockwise) by just a quarter of a turn. This will not affect the heat capacity of these radiators, but you will notice that more hot water is diverted to the downstairs radiators. 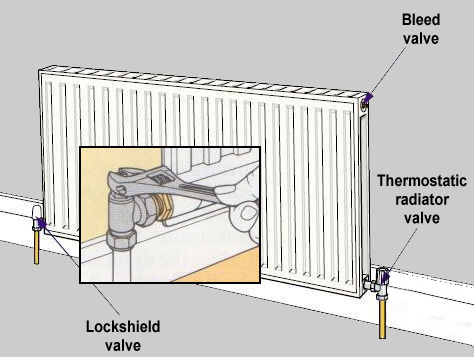 * Thermostatic Radiator Valve - this automatically controls the flow of hot water to the radiator and does not affect the balancing of your system. If you find that one of your downstairs radiators is still quite cool, but the other is hot, close the lockshield off on the hot radiator, then turn it on by a quarter of a turn as above. 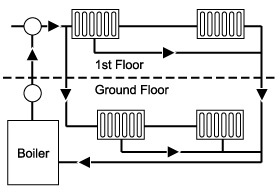 Simple schematic of a 2 storey heating system. (may be reversed on some systems).